If you are going away on vacation and you plan to be gone for quite some time (maybe a week at the most), one of the predicaments you have in regards to leaving your house is your plants in your organic farming project. Who is going to water your plants while you are away? While you can always depend on a relative or a friendly neighbor, that does not work if you don’t have access to anyone who can do the watering for you. Certainly, you cannot live a vacation-less life just because you are concerned about the welfare of your plants. If you are going to be away for just a couple of days, you can soak the plants well and leave them there for two to three days. They are not going to die or wither by not being watered in a day or two. They’ll do just fine. Your problem is if you plan to be away for about a week. Sensitive plants may die in that amount of time and of course, you wouldn’t want to come home to a garden with dead plants and flowers. Don’t do this if you just plan to be away for a couple of days. You don’t want to abuse a neighbor who’s trying to be nice to you. Ask the favor if you’ll be away for more than a week or two. The neighbor can come in a couple of times each week or three times at least to water your plants. Of course, make sure to return the favor when the neighbor will be away for vacation, too. If you have installed an automatic sprinkler system then that’s well and good. However, make sure to test the system first before you go. You don’t want to come home to withering plants because your sprinkler system did not work. Grouping container plants together create a humid microclimate. 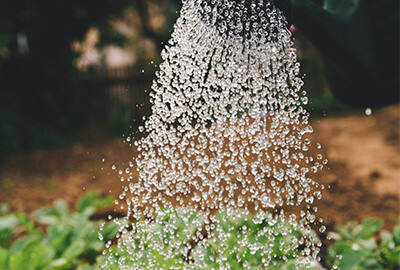 The mulch that you apply around the plants will keep the moisture at a level where your plants won’t wither or die because of being left alone without proper watering. This is okay if you placed the kit before you planted the pot. If you haven’t planned ahead, it can be quite a chore to replant all of your containers. A self-watering conversion kit goes in the bottom of the pot and they will water the plant that’s in the container for the time that you’re away. Cut a soda bottle in half and take the half that contains the cap. This now resembles a funnel. Poke a small hole in the cap with a drill or nail. Place the overturned bottle in the ground with the cap buried and the open end ready to hold water. Fill the open end with water so it will slowly drip from the bottle while you’re away.